Many fish is threatened with extinction. Catching fish might take much energy depending on the trapping technique. In addition, cultivation, transportation and cooling of fish takes energy. 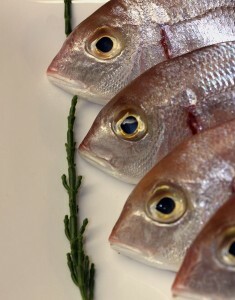 If you want to know which fish is caught with what technique you can look into the VISwijzer (Seafood Guide). The VISwijzer is prepared by the North Sea Foundation, GoodFishFoundation and WWF. North Sea Foundation is an independent nature and environmental organization, which is committed to a clean and beautiful North Sea. What does the VISwijzer keep in mind? Each species is assessed separately. The assessment method consists of criteria for wild caught fish and criteria for farmed fish. 2) the effects of fishing and fishing technique – are there many by-catches? Is gear causing damage to the soil? 3) (effectiveness) sustainability measures – this involves both government measures as measures by fishermen themselves. 2) composition and quantity fish feed - where does it come from and how many fish-feed does the farmed fish eat? 3) the effects on the environment – is the water being polluted or can deseases be spread? 4) the (effectivity of) the management/ control – are the requirements of the government taken into account? And what is done extra? In the list below the fishes are summarized which have been approved by Stichting De Noordzee as Prima keuze (=Great Choice)  . Note: The method of fishing and/or specific origin of a fish leads to the label Prima Keuze (=Great Choice). So pay attention to that in the store. E.g. Haddock caught with lines is fine, but with bottom fishing again second choice. It is important to check the VISwijzer(=Fishpointer) on a yearly base, since there are new developments which may be an impact on the different fish. M SC stands for Marine Stewardship Council and is similar to FSC-certified wood (well managed forests). Who buys a fish or fish product with the MSC label knows that this fish is caught responsibly and that nature is spared. The label is recognizable by the blue logo. The customer can assume that the fish actually comes from fishermen who fish in a sustainable manner; there is no overfishing, damage to the soil or too much by-catch. MSC fish is in the first column of the VISwijzer. What is the environmental impact of the various species of fish? The VISwijzer does not include information about a number of things. 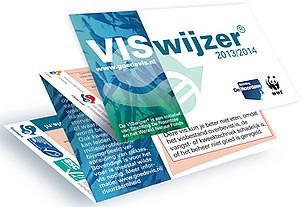 About the VISwijzer: “The energy consumption in the fishing phase is not taken into account. The chain links, after landing ashore (such as transport, processing and packaging) are also not included in the VISwijzer “ . Wild caught fish (not-farmed): To a large extent the energy load on the environment is determined by the method of capture. Methods that drag nets across the bottom (bottom fishing, trawling), cause a lot of soil damage and require a lot of fuel. Fish that do not live on the bottom, called pelagic species, do not have to be caught with bottom-nets and require consequently less energy (ring nets / purse seine, line fishing, gillnet fishery). Because not all fish are included in the analysis of Blonk, the author made an assumption about the environmental impact (based on the method of capture). It is assumed that pelagic species from N-Europe consume as much energy as the herring fishing from N-Europe with purse seines. In table 2 in the Appendix these assumptions have been incorporated. Farmed fish: Regarding “farmed fish” only figures are known from Pangasius (farmed, Vietnam) and Salmon (farmed, Norway). Panga is just above the value of chicken breast, Dutch farmed fish takes probably less transport and cooling energy. You might therefore conclude that Dutch farmed fish are below or around the acceptable level of chicken breast. Herring (MSC), Codfish (MSC) and Sea Bass (LineFishing), Mullet (Gill net fishery) from the North-European waters take less indirect energy than chickenbreast , moreover, they are responsible caught and is no overfishing, damage to the soil or by-catch. Claresse/Catfish, Tilapia and Turbot(Farmed), all Dutch farmed fishes, they are probably under or around the levels of chickenbreast. There is no comparable data available at the author about the total energy use of fishes produced/catched outside Europe. The VISwijzer indicates the following fishes as “Great Choice”: Swordfish (NW Atl. Oceaan), Victoria Perch (Tanzania), Crayfish (China), Tuna Albacore (Pacific), Tuna Skipjack (East atl., Pacific and Ind. Ocean.) and also the fishing-methods do not lead to above average energy use. Sole has performed poorly in the North Sea, for that reason it is not considered further.